This Week in Law (MP3) | Listen Free on Castbox. Remix culture copyright, strangers may be watching your Ring video, location data up for sale to bounty hunters, social media rules for politicians, Apple trolls CES, consumer advocacy groups want the FTC to look at kids' apps on Google Play, lessons to learn from COPPA, the "F Word" in the Supreme Court, Bob Ambrogi's 20 Most Legal Tech Developments for 2018, and more!Hosts: Denise Howell, Stefan Szpajda, and Matt CurtisGuest: Bob AmbrogiDownload or subscribe to this show at https://twit.tv/shows/this-week-in-law.Public list of discussion pointsTWiL on FacebookAttorneys may submit a self-study form to their local CLE board seeking MCLE credit approval. Please check the rules and requirements for your specific jurisdiction before submitting any forms.Special thanks to Nigel Clutterbuck for the TWiL theme music. Denise Howell, Matt Curtis, Stefan Szpajda, J. Michael Keyes look back on the best of This Week in Law from 2018!Hosts: Denise Howell, Stefan Szpajda, Matt Curtis, and J. Michael KeyesDownload or subscribe to this show at https://twit.tv/shows/this-week-in-law.Public list of discussion pointsTWiL on FacebookAttorneys may submit a self-study form to their local CLE board seeking MCLE credit approval. Please check the rules and requirements for your specific jurisdiction before submitting any forms.Special thanks to Nigel Clutterbuck for the TWiL theme music. Professor Mark Bartholomew, author of ADcreep: The Case Against Modern Marketing joins Denise Howell and Stefan Szpajda to talk about the advertising industry, apps sharing your location data with advertisers, how brain scans may help the future of marketing, Congress questions Google CEO Sundar Pichai, and more!Hosts: Denise Howell and Stefan SzpajdaGuest: Mark BartholomewDownload or subscribe to this show at https://twit.tv/shows/this-week-in-law.Public list of discussion pointsTWiL on FacebookAttorneys may submit a self-study form to their local CLE board seeking MCLE credit approval. Please check the rules and requirements for your specific jurisdiction before submitting any forms.Special thanks to Nigel Clutterbuck for the TWiL theme music. Mastercard and Microsoft team up to create a "digital identity" system, is group chat the future of social media? Brokering Bitcoin, smart contract developers and the SEC, are browsewrap terms of service enforceable? 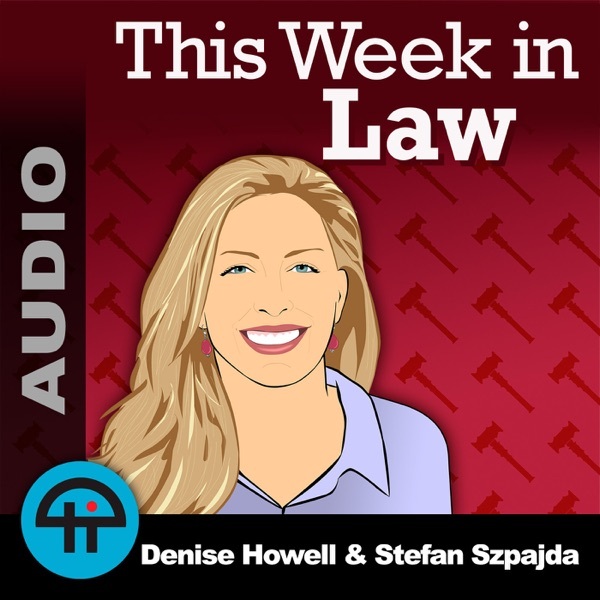 And more!Hosts: Denise Howell and Stefan SzpajdaGuest: Evan BrownDownload or subscribe to this show at https://twit.tv/shows/this-week-in-law.Public list of discussion pointsTWiL on FacebookAttorneys may submit a self-study form to their local CLE board seeking MCLE credit approval. Please check the rules and requirements for your specific jurisdiction before submitting any forms.Special thanks to Nigel Clutterbuck for the TWiL theme music. Taylor Swift's record deal may affect the music industry, Bobby Brown sues over the Whitney Houston documentary, website blocking, data privacy, and insurance, the first GDPR fine, Payless wants to see how much people will pay for $20 shoes, Alexa on the witness stand, and more!Hosts: Denise Howell and Stefan SzpajdaGuest: Stephen EmbryDownload or subscribe to this show at https://twit.tv/shows/this-week-in-law.Public list of discussion pointsTWiL on FacebookAttorneys may submit a self-study form to their local CLE board seeking MCLE credit approval. Please check the rules and requirements for your specific jurisdiction before submitting any forms.Special thanks to Nigel Clutterbuck for the TWiL theme music. AT&T to crack down on piracy by cutting off service, 'Piracy Protection' insurance, Satanic Temple sues a Netflix TV show for copyright on a statue, Apple has a tool to see what data is collected, sued over a retweet, bots to help you in small claims court, Intel's data privacy bill and more!Hosts: Denise Howell and Stefan SzpajdaGuest: Irene MoDownload or subscribe to this show at https://twit.tv/shows/this-week-in-law.Public list of discussion pointsTWiL on FacebookAttorneys may submit a self-study form to their local CLE board seeking MCLE credit approval. Please check the rules and requirements for your specific jurisdiction before submitting any forms.Special thanks to Nigel Clutterbuck for the TWiL theme music. TWiL 442: Are You Feelin' Lucky, Punk? Blockchain experts Joshua Ashley Klayman and Ethan M. Seery join Denise Howell and Stefan Szpajda to talk about Bitcoin's 10th birthday, how Bitcoin is not really anonymous, ICO's and Securities Law, how cryptocurrencies should be regulated, Malta's strategy for the blockchain, does blockchain conflict with GDPR? And more!Hosts: Denise Howell and Stefan SzpajdaGuests: Joshua Ashley Klayman and Ethan M. SeeryDownload or subscribe to this show at https://twit.tv/shows/this-week-in-law.Public list of discussion pointsTWiL on FacebookAttorneys may submit a self-study form to their local CLE board seeking MCLE credit approval. Please check the rules and requirements for your specific jurisdiction before submitting any forms.Special thanks to Nigel Clutterbuck for the TWiL theme music. In this Halloween themed TWiL: AI-Art sells for $432,500, will there be a ban on killer robots? An Alexa powered drone for your house, Jet Li rejected the Matrix because he didn't want to be digitally recorded, releasing music on DNA, 20 years of the DMCA, Feds say hacking DRM to fix your devices is OK, GDPR makes Google more dominant in Europe, using dead people's fingers to unlock their phones, rules for digging up dead people, black cat selfies and more!Hosts: Denise Howell, Stefan Szpajda, and Matt CurtisDownload or subscribe to this show at https://twit.tv/shows/this-week-in-law.Public list of discussion pointsTWiL on FacebookAttorneys may submit a self-study form to their local CLE board seeking MCLE credit approval. Please check the rules and requirements for your specific jurisdiction before submitting any forms.Special thanks to Nigel Clutterbuck for the TWiL theme music. Mocking Kanye for showing his password on camera, Feds forcing people to unlock their phones with FaceID, the CFAA and the First Amendment, Fortnite profiting off of other people's dance moves, a game company uses facial recognition to detect minors, "Do Not Track" on browsers doesn't do anything, and more!Hosts: Denise Howell and Stefan SzpajdaDownload or subscribe to this show at https://twit.tv/shows/this-week-in-law.Public list of discussion pointsTWiL on FacebookAttorneys may submit a self-study form to their local CLE board seeking MCLE credit approval. Please check the rules and requirements for your specific jurisdiction before submitting any forms.Special thanks to Nigel Clutterbuck for the TWiL theme music. Great discussion on genetic technology. Am I the only one who listening this? why no comments? Law can be tedious and frustrating. But, like many Podcasters and Musicians, i now believe it is prudent and responsible for us to be savvy to this aspect of our craft. These lawyers are doing their part. My part is to listen carefully to what they are discussing, and grok as much of it as i can. I welcome this Podcast. Thank you.